Robert J. Sawyer gave a great talk at our Paul Sykes Lecture last week that featured the relationship between science/astronomy and science fiction. Robert has written many science fiction books with astronomy themes and here is a list of six real stars that have appeared in Robert’s books. Most are visible with the naked-eye from a dark site where the limiting magnitude is 5.0 or fainter but some are only visible from the southern hemisphere. Beta Hydri: A close double with components at magnitude 4.7 and 5.5. It barely makes it above the southern horizon when observing from Vancouver. The main component is a giant star with a mass of about 3.3 suns. It lies at a distance of 350 light-years. In Calculating God, the character Hollus, an alien whose species calls themselves the Forhilnor, is from the fictional third planet in the Beta Hydri system. Delta Pavonis is a 3.5 magnitude star in the southern constellation Pavo (the Peacock). It is a sun-like star located 20 light-years from Earth. Spectroscopy has shown that Delta Pavonis has a higher concentration of elements heavier than helium compared to our Sun. This leads scientists to speculate that it is more likely to have a planetary system though no planets have yet been detected. The SETI Institute has identified it to be the “best SETI target” in a survey of nearby stars. The alien race called the Wreeds in Calculating God are from a planet in the Delta Pavonis system. Groombridge 1618 lies in the constellation Ursa Major. It is a 6.6 magnitude star located at a distance of 16 light years. It is an orange-red dwarf with about two-thirds the mass of the sun. Virtual beings from a planet orbiting Groombridge 1618 engineered the supernova of Betelgeuse in Calculating God. Sigma Draconis is also know by its traditional name “Alsafi” which derives from an Arabic word meaning the tripods used by nomads for open-air-cooking. It is 19 light years away has a magnitude of 4.7. It shines with only 40% of the Sun’s luminosity despite having 90% of the Sun’s mass. In Rollback, Sarah Halifax is an astronomer who translated signals from Sigma Draconis as the first transmission received from an extraterrestrial source. Betelgeuse marks the shoulder of the hunter in the constellation Orion. It is very bright at magnitude 0.6 and appears orange in colour. Betelgeuse is a red supergiant and is one of the largest known stars – if it was located in our solar system then its surface would extend half-way to Jupiter and engulf all the inner planets (Mercury, Venus, Earth, and Mars). Massive stars use their fuel quickly and Betelgeuse has already run out of hydrogen and is fusing helium into carbon and oxygen. Some astronomers predict that it will run out of fuel and explode as a type II supernova within the next thousand years. Such an explosion would be visible in full daylight and be brighter than the full Moon! At the end of Calculating God, Betelgeuse goes supernova. The supernova explosion occurred over 400 years before the events of the novel but the radiation is first reaching Earth at the present time due to its distance from Earth. The supernova may have been deliberately triggered by an alien intelligence. Photons are the fundamental particle of light. Senors in our retina respond to photons emitted by distant starts when we look up at the night sky. How much light has been emitted by all the stars in the universe since its birth? The answer, as reported in the journal Science by a team of astrophysicists, is 4 x 10⁸⁴ photons as written in scientific notation – that is a 4 followed by 84 zeroes! Our universe is old and vast. It is roughly 13.7 billion years old and is thought to contain over a billion-trillion stars – way too many to measure directly. Instead, this team of scientists used the Fermi Gamma-ray Space Telescope to indirectly measure the photon density of the universe at different time points in its history. Gamma-rays are a high-energy form of electromagnetic radiation. Starlight photons can collide with gamma-rays producing a pair of electrons and reducing the energy of the gamma-rays in the process. More collisions occur when the density of photons is high so looking at a source of gamma-rays and measuring the energy lost to photon collisions is a way to measure the photon density. Gamma-ray sources with different ages then provide the photon density at different time periods. 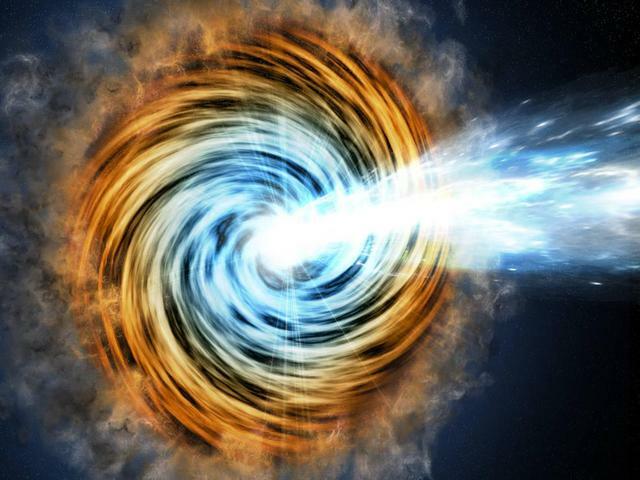 The team studied 739 blazars as their sources for gamma-rays. Blazars are thought to be powered by super massive black holes. The accretion of matter into the black hole shoots jets of gamma-rays perpendicular to the spin axis of the black hole. A blazar is positioned so a jet is pointed directly at the Earth. The blazars in this study ranged in distance from 200 million light-years to 11.6 billion light-years which corresponds to different ages and time-periods. In addition to the total number of photons, the study also found that the rate of star formation rose in the first two billion years of the universe, peaked roughly 10 billion years ago, and has been declining since then. Despite all those starlight photons, far more photons were made in the Big Bang and are now part of the so-called cosmic microwave background radiation – there are estimated to be 1089 CMB photons! 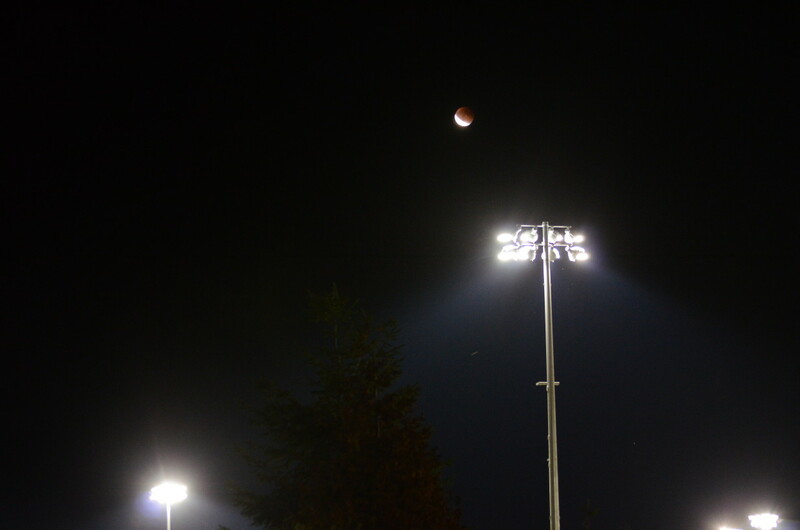 A lunar eclipse with over 60 minutes of totality will be visible from BC and most of North America on Sunday Jan 20th, 2019 – weather permitting. RASC volunteers will be at Vancouver’s MacMillan Space Centre for a special eclipse viewing event. If the weather cooperates then the Trottier Observatory at SFU will also be open for a special Starry Nights event. A total lunar eclipse occurs when the Sun, the Earth, and the Moon line up so that the Earth’s full (umbral) shadow falls on the moon. The moon doesn’t completely disappear but it will be cast in an eerie darkness and take on a reddish hue. The eclipse starts at 7:35 pm PST with the Moon in the south-east sky slightly more than 20° above the horizon. The mid-point of totality occurs at 9:13 pm PST and by then the Moon will have moved more towards the south and climbed to an altitude of 42°. You can watch the the eclipse with the naked eye but binoculars make eclipse colours more vivid and give great 3D views. 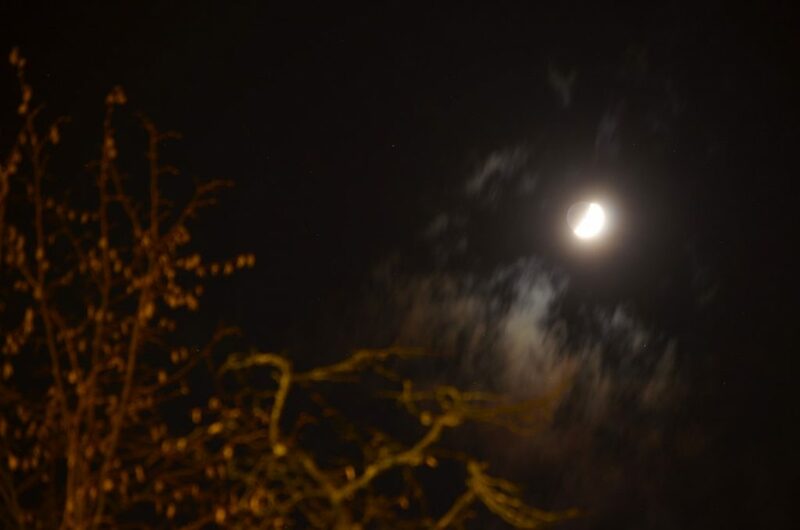 Lunar eclipses are easy to observe even in light-polluted city skies. A telescope allows you to watch the eclipse encroaching on craters one after another. If you are interested in photography then check out Alan Dyer’s fantastic article on how to photograph the lunar eclipse. 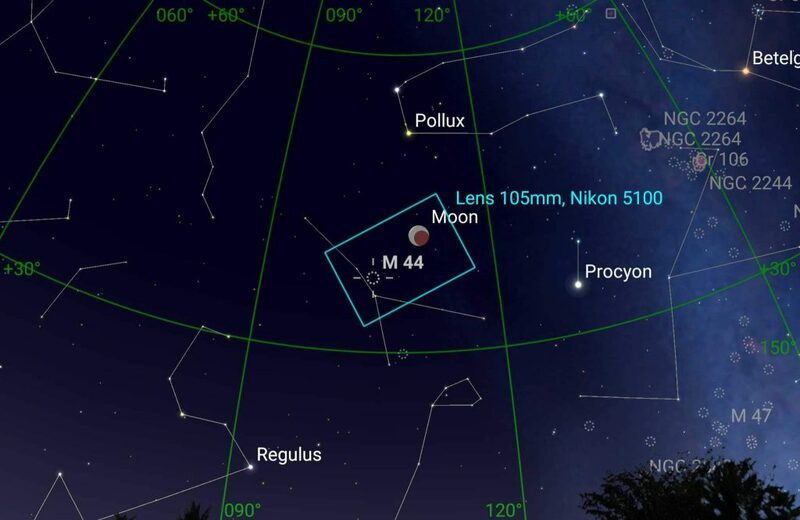 I am going to try to get a shot of the eclipsed moon near the open star cluster M44 – the Beehive Cluster – in the constellation Cancer. I have been doing a bit of planning and practice to improve my chances of getting a good shot. The Moon will be located a bit over 6° from M44 so it will be a widefield shot. I entered the data for my Nikon D5100 DSLR with a 55-200mm zoom lens at 105mm and a focal ratio of F4.5 into the SkySafari app to verify the field of view will nicely frame both the cluster and the Moon. But what about the exposure time? Dyer notes that “the crescent Moon with Earthshine on the dark side of the Moon is a good stand-in for the eclipsed Moon.” Fortunately, there was a clear patch tonight so I took a few test images at ISO 400 to practice and get a rough idea of the exposure settings – some Earthshine is visible with a 2 second exposure but stars only start to become visible with a 5 second exposure. Click on the 5-second exposure image to see a larger version – the star that is visible a little above and to the right of the Moon is the 4.8 magnitude star 20-Cetus and most of the stars in the Beehive cluster are much fainter with magnitudes above 6.3. So I’ll need to take images at different exposures: about 1-2 seconds to capture the eclipsed moon and 20 seconds or more to capture the faint stars in the cluster. I’ll try using HDR techniques (high dynamic range) to combine the several exposures into a single image – either using the D5100’s builtin HDR setting when taking the shots or during post-processing. The rule of 500 says that the maximum exposure time to avoid star trailing is 500 / effective-focal-length. My Nikon 5100 is an APS-C crop sensor with a multiplier of 1.5X which gives me at maximum exposure of 500 / (105 * 1.5) which is just 3.2 seconds. So, I am planning to piggyback the camera on my motorized/HEQ 5 Pro mount to track the stars and avoid trailing with the 20+ seconds needed to capture the stars in the cluster. The hardest part may be getting a clear sky, in January, in Vancouver! The RASC national office offers seven observing programs to promote active observing and has recently released videos about these programs that you can watch in this playlist. Explore the Universe — A program for the novice observer, covering all major astronomical objects, including constellations, bright stars, the Moon, the Solar System, deep-sky objects, and double stars. (Open to members and non-members). Explore the Moon — An introductory lunar observing program based on 100 features in the RASC Observer’s Handbook. Messier Catalogue — Follow Charles Messier’s 18th-century journey through the northern skies by observing his famous list of 110 “not comets,” including galaxies, nebula, clusters, and other deep-sky objects. Isabel Williamson Lunar Observing Program — The RASC’s intermediate-level lunar observing program, more thorough than Explore the Moon, requiring a mid-sized telescope (150+ mm). Deep-Sky Gems — An advanced list of 154 deep-sky objects (mostly galaxies) selected from David Levy’s 40+ years of comet hunting. Observing programs are a great way to learn more about the night sky, challenge yourself, and to get the most out of our rewarding hobby. By successfully completing a program, a RASC member may apply for an official certificate for that program (non-members may apply for the Explore the Universe certificate). Several certificates come with lapel pins. 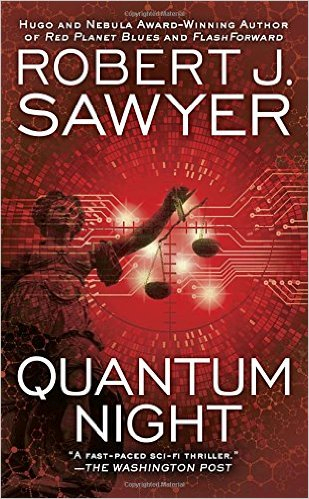 The speaker for our annual Paul Sykes Memorial Lecture is the renowned Canadian science fiction author Robert J. Sawyer. Robert J. Sawyer is one of only eight writers in history — and the only Canadian — to win all three of the world’s top Science Fiction awards for best novel of the year: the Hugo, the Nebula, and the John W. Campbell Memorial Award. Please RVSP on our meetup site. Robert’s talk sets the stage for thinking about the rapid pace of change that’s coming down the pike by showing how science fiction visions are increasingly becoming real. Captain Kirk’s communicator and tricorder are now embodied in our smartphones; robots have walked off the pages of science fiction into our living rooms; and the Jetsons’ hyperconnected lifestyle has become our daily reality. Rob shows why science fiction has been called “the only preventive medicine for Future Shock,” and explains how extrapolative science-fiction thinking and rapid adoption of cutting-edge technologies can aid businesses as they rush to meet the future. These annual memorial lectures honour Paul Sykes. Paul actively pursued his interest in astronomy, attending conferences and joining RASC, where he became a Life Member. Paul Sykes passed away in October 2005 at the age of 87 and left the Vancouver Centre a generous gift. Paul Sykes was born in Hummelston, Pennsylvania USA in 1918. He acquired his interest in astronomy at an early age. During his teens he published his own monthly astronomical column and gave at least one lecture. He was an officer in the United States Air Force, served in the Pacific during WWII attaining the rank of Captain. He was awarded a Presidential Unit Citation, the U.S. Air Medal, the Oak Leaf and Cluster and the Bronze Star. Following the war he attended UBC earning a degree in Physics in 1948. He rejoined the United States Air Force and attended the Oak Ridge School of Reactor Technology, studying nuclear physics. He worked on the NERVA Project, a nuclear rocket development effort and rose to the rank of Major. Paul was appointed a lecturer and administrator in Physics at UBC and remained there until retirement in 1983. China’s Chang’e-4 spacecraft made the first ever soft-landing on the far side of the moon on Wednesday Jan 2nd, 2019. The far side of the moon never faces the Earth so radio signals are blocked by bulk of the moon. How do the Chinese communicate with their spacecraft and lander? They use a relay satellite that is parked in space on the opposite side of the Moon from Earth. The relay satellite “Queqiao” was launched in May 2018, months before Chang’e-4 launch in December. It now sits in what is known as the L2 Lagrange point of the Earth-Moon system. In the 1700s, the mathematicians Euler and Lagrange discover 5 points where the combined gravitational forces of two larger bodies (in this case the Earth and the Moon) create a small area of gravitational stability. A smaller body (such as a relay satellite) at one of these points can maintain a stable or nearly stable position relative to the large bodies. There are five Lagrangian points but the L2 Lagrangian point is located directly opposite the Earth from the Moon. Parking the relay satellite Queqiao at the L2 point means that it always stays at the same relative position, lined up with the Earth and Moon, as the Moon orbits the Earth and as the Earth-Moon system orbits the Sun. Queqiao is the first communications satellite to utilize this L2 point. Animation of the relative position of Lagrangian points in a two body system. A normal mission to lunar orbit usually takes four or five days, but Queqiao took longer to reach its special orbit at the L2 point. Along the way, Queqiao deployed two micro-satellites called Longjiang-1 and 2 that were to enter lunar orbit. Unfortunately, only Longjiang-2 was successful in the braking maneuver required to reach lunar orbit. 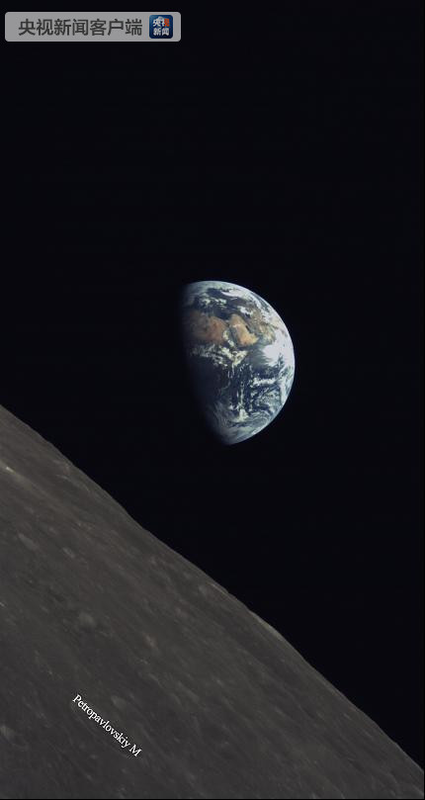 The Earth as seen from Longjiang-2, with Petropavlovskiy crater, on the far side of the Moon, in the foreground. NASA’s New Horizons spacecraft will welcome the New Year with a flypast of the most distant solar system object ever visited. 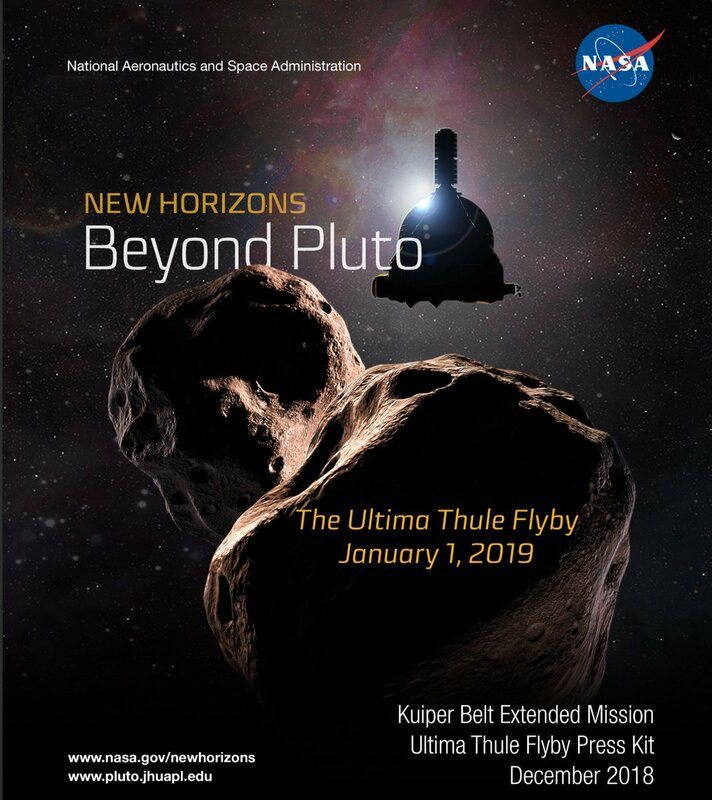 New Horizons made headlines when it flew past Pluto and Charon in 2015 and is now headed for a rendezvous with the Kupier Belt object “Ultima Thule”. Here are 19 facts about this encounter to start the year 2019. The closet approach is predicted to occur at 09:33 PM on Dec 31st, 2018 PST. Ultima Thule was discovered in 2014, 8 years after the launch of the New Horizons spacecraft. Ultima Thule is approximately 37 km across, about the same distance as a drive from Point Grey to Coquitlam. At its closet approach, New Horizon is expected to be 3,500 km from Ultima Thule. This is 3 times closer than it was to Pluto and should result in higher resolution images and spectroscopic data. Ultima Thule formed in middle of the Kupier Belt where temperatures are close to absolute zero and it is too small to have a geologic engine like Pluto. Hence, scientists expect it to be a well-preserved sample of a planetary building block. The first health status signal is expected to be received around 07:00 am PST on Jan 1st with the first image data coming in a few hours later. Look for the first images to be released on Jan 2nd, 2019. 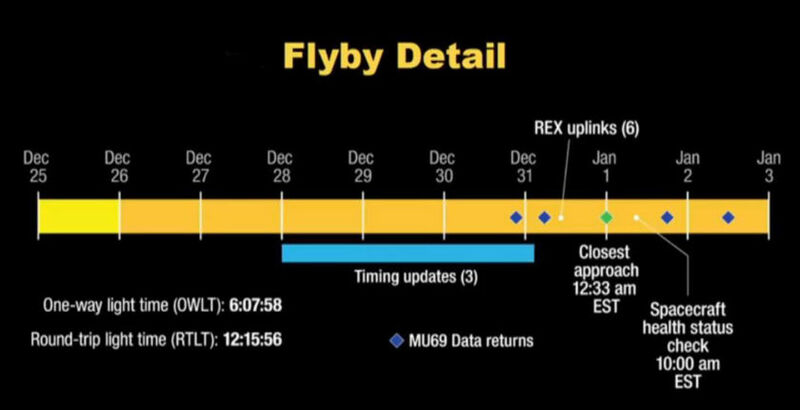 New Horizons will collect about 50 GB of data during its flypast but it will take about 20 months to send all that data back to Earth. Analysis of recent light curves haven’t revealed the variations predicted by previous observations. Alan Stern, the principle investigator, has called this discrepency “Ultima Thule’s first puzzle”. The orbit of Ultima Thule was not well established so New Horizons has been imaging it and has made several course correction maneuvers to adjust for differences in its predicted position vs its actual position. The last correction was a short 27 second burn on Dec 20th, 2018. New Horizons entered “Encounter Mode” on Boxing Day so its on-board software will now handle any problems without intervention from Earth. A Hazards Team scoured images for signs of moons or other dangerous debris along New Horizons’ path but gave the “all clear” signal in December 2018 for a close flyby. Ultima Thule may be shaped like a rubber ducky or possibly two separate bodies based on observations made during its occultation of a star in 2017. Ultima Thule’s official designation is 2014 MU69. The apparent magnitude of Ultima Thule is 27: too faint for all but the most powerful telescopes. The name “Ultima Thule” was nominated by about 40 people in a public campaign for selecting a nickname. It refers to a distant place located beyond the borders of the known world. Ultima Thule orbits the Sun once every 295 years. Ultima Thule is not visible in the night sky on Dec 31st as it is located in the constellation Sagistarius and will be less than 5° from the Sun. It will reach naked eye brightness (magnitude 6) as seen from New Horizons’ point of view 3-4 hours before closest approach. For more information on the New Horizons mission, including fact sheets, schedules, video and images, visit: http://www.nasa.gov/newhorizons and http://pluto.jhuapl.edu. This Saturday, a full moon is trapped within the six bright stars that make up the huge asterism known as the Winter Hexagon. Asterisms are easily identifiable patterns of stars, like constellations, but they are not recognized by the International Astronomical Union. Asterisms may be a part of a constellation (like the big dipper), or can be composed of stars from different constellations as is the case with the Winter Hexagon. 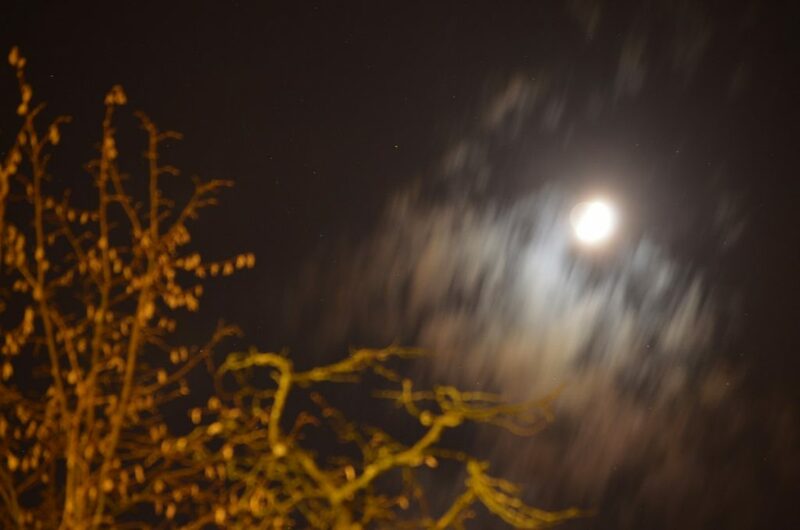 The Winter Hexagon encircling the full Moon on Dec 22nd at midnight as seen from Vancouver. The six stars that make up the Winter Hexagon include some of the brightest stars in our sky; five of the six are among the top-10 brightest stars visible from the northern hemisphere. Here is a summary along with each star’s visual magnitude. Capella (+0.07), the fourth brightest star in our sky, was the discovered to be a binary in 1899 based on spectroscopy. Photographic plates displayed two superimposed spectrums with different Doppler shifts. This revealed two components that were periodically moving towards and away from Earth and thus orbiting each other. 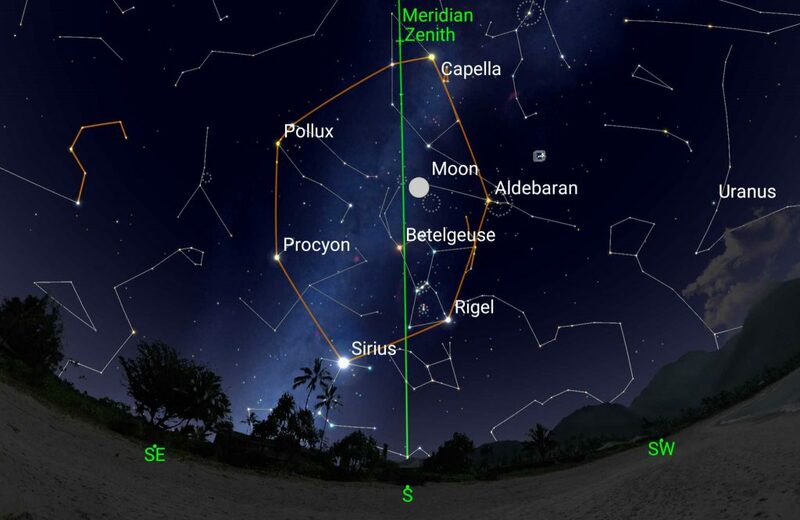 Aldebaran (+0.99) marks the red eye of Taurus the bull. It is the ninth brightest star. It lies close enough to the ecliptic to be occulted by the Moon. In about two million years, NASA’s Pioneer 10 spacecraft will make a fly past of Aldebaran. Rigel (+0.28) is the fifth brightest star in our sky, but it is designated β Orionis because the variable red giant Betelgeuse (α Orionis) is occasionally brighter. Rigel is a blue-white super giant that shines with the luminosity of 40,000 Suns. Sirius (-1.44), commonly called the “dog star”, is the brightest star in the sky and is twice as bright as the next brightest. Its brightness is mostly due to its proximity to Earth. At a distance of 8.7 light years, it is the 5th nearest star system. Procyon (+0.40) is another close neighbour with a distance of 11.4 light years. It ranks as the sixth brightest star in our sky. Pollux (+1.22) lies close to its slighter dimmer twin, Castor, in the constellation Gemini. Pollux is much more massive than the Sun and, despite being younger in age, it is in a more mature stage of its life cycle. Its nuclear furnace has already shifted from fusing hydrogen to helium into fusing helium into carbon and oxygen. As the 12th brightest star in our sky, it falls just outside the top 10-list.